Storage temperature has a significant affect on shelf-life. The cooler the better! For every reduction in storage temperature of 10-degrees-C (18 F) the expected shelf life will double! That is pretty significant. A storage temperature of 90 F instead of 72 F will halve the expected shelf life. The process of dehydrating removes most of the moisture from foods while retaining much of the nutritional value and flavor. It is a great method to preserve your harvested fruits and vegetables for later consumption off-season. Fruits will typically contain about 75 percent moisture when fresh, and should be dehydrated to an approximate 20 percent moisture level, the point at which they become leathery and pliable. Apparently it is okay for fruits to be dried to this ‘pliable’ level rather than a lower ‘brittle’ moisture level because the natural sugars and acids in fruit act as an added preservative. Vegetables should be dehydrated to a moisture level of at least 10 percent (lower is better), or to the point at which they become crisp and brittle, and will break or snap if bent. Oxygen will interact with, and break down fats and proteins resulting in poor flavor and eventual spoilage. Fruits and vegetables only have small amounts of fat and protein but will still oxidize over a period of time when stored in an environment containing oxygen. This may be a particular concern if you are storing your dehydrated foods for “long term” (years). You might consider using a vacuum-sealer with vacuum seal bags, or glass jar storage (there’s also a Food-Saver attachment to remove the air). Photons from light will also eventually break down fats and proteins as well as vitamins in the food, resulting in poor flavor and possibly eventual spoilage. Therefore it is preferable to store foods in dark places or in opaque containers. Shelf life and Best by dates are different things. In short, “Best by” dates on food packaging labels is defined as the maximum date which food will still taste its best and retain most all of its nutritional value, and is usually a date long before actual spoilage. The ‘Use-by’ and ‘Best-by’ dates are intended for consumer use. It is the date the manufacturer deems the product reaches peak freshness. It is NOT a date to indicate spoilage, nor does it necessarily signal that the food is no longer safe to eat. Having said that, “shelf life” is subjective and variable, depending on storage factors listed above, and the food itself. Very generally speaking, home dried fruits will have an approximate typical minimum shelf life of 6 months to 1 year. That said, the shelf life may be drastically lengthened upon ideal storage conditions as well as the dehydrated dryness level of the food itself (the drier it is, the longer it will store). Note that professionally dried foods will typically store longer due to having achieved a very low moisture level with professional equipment. The shelf life of home dried vegetables will vary depending on the vegetable itself and how dry it is (% moisture content), however a typical shelf life expectancy should be at least up to one year. That said, it is possible to achieve MANY years of shelf life with good storage practices. Store-bought dehydrated vegetables processed specifically for long term storage will be prepared, dried, and packaged in processes that bring moisture content down to as low as 3 percent, and will store much, much longer (I’ve seen claims of 25 years in #10 cans if stored properly). My experience with home-dehydrated food shelf life has been excellent of late. Early on when we first started out with our Excalibur dehydrator, we tried storing some of the vegetables in Zipolc bags in a cool closet environment. About 6 months to 1 year later we noticed that some of it didn’t seem quite ‘right’, so we tossed it. Since then we’ve learned (for long term storage) to store our dehydrated foods either in vacuum-sealed bags or in glass jars (Mason jars). Lets hear your further comments on your own success stories (or lessons learned) regarding dehydrated food shelf life and storage. This article was originally published years ago (although I’ve recently updated it), so there are existing comments from that time-frame. Great article. I’ve tried the fruit drying but it never ends up making it into the jar as we tend to eat it straight away so unable to check if it actually sotres properly! The whole dehydration thing just reminds me of Back to the Future 2. Will we end up with food rehydrators on every table? “Rehydrate level 4 please”. Had two cases of #10 cans of dehydrated Apple’s from Mormon cannery in our supplies. When we moved I could not find them and asked the wife if she knew were they went or if we left them behind. She got a funny look on her face and said I ate them. She just love them and snaked on them at night after I went to bed. Picked up some more at the cannery and hid them in the pile of supplies in the back. It don’t matter if it makes my honey bunny happy. Great article. In my opinion, storing in a air-tight container and a cool place is best. For storing foods ‘as long as possible’, I recommend purging all the air from the container, such as using a vacuum sealer. Foods like wheat, rice, beans, and others can store for a decade or more IF stored properly in 5-gallon sealed containers in sealed Mylar bags with Oxygen absorbers (2,000 cc’s per 5-gallon bucket). We have been drying our own fruit and vegetables for some time and have had no problems. You just need to dry them very well. We have some that are over two years old and are still fine. I love the picture of your jars of food. What do you do with your dehydrated bananas? We like using the jars because we can quickly see what’s in them. For dehydrated foods stored for longer term, we use a vacuum sealer. The bananas re-hydrate well enough in all sorts of cereal or breakfast creations. They make a good crisp snack too. Ken, I’m curious as to why the shelf life of dehydrated products wouldn’t be indefinite if they’re kept in airtight containers in a cool, dark place. If you remove air, moisture, light and heat, what else could affect them? I recently did a taste test on mackerel that I’d dehydrated 2-1/2 years ago and had kept unopened in a mason jar and it tasted fine. I’m not seeing how shelf life on dehydrated products could be only a year or two if they’re dry and unopened in airtight containers. Any thoughts? Professionally dehydrated foods that are sealed in air-tight containers with oxygen-free environments can last 10 years or more. The same food that has been dehydrated at home may only last a year before starting to become questionable, if some of the optimizations have not been adequately met. I have been trying to find a chart for the shelf life of dehydrated foods versus freeze dried food. Well I think you just answered me. I guess the answer is, “it depends”. I’m assuming that means what the food is stored in, temperature, or light or dark. I would really rather have a chart to compare, and decide the longest shelf life for different foods. Thanks. I have dehydrated veggies for over 17 years now. Have chowed down on Mason Jar, vaccum packed veggies that were over 15 years old. Tasted great and as most university reserch says, plenty more nutrition than canning. If the food has been dehydrated optimally equating to professional dehydration with very low, single digit % moisture content, and packed optimally (removing oxygen, sealed under a vacuum with nitrogen, etc..), and depending on the type of food itself, I’m not surprised that one could achieve 15 years shelf life. well, just the info I needed..except, am wondering if you can help me out..with info. just got heck of deal on cases of mushrooms, dehydrating in good dehydrator till “snap/crunch”..
so, am wondering, if it makes a huge diff if I store in Ziploc bags as opposed to jars? I do not have a vacuum sealer machine, so that is not in equation. I am planning to put the bags in my spare fridge. so, given the above, how long is it safe to eat these dried mushrooms/stored in fridge? also, what is the risk? for example, if they do start to get spongy, could I just dump them back in the dehydrator and do over? If you aren’t going to invest in a vacuum sealer, why bother dehydrating?? Just keep in the fridge. Brake bleeder from Harbor Freight–I have one for when no electricity–I can still seal my jars. A vacuum sealer will keep the product safer for longer. Would it not add shelf life if I were to add food grade silica packages to my mason jars? Yes, that makes sense. The less moisture, the better. For the dehydrated foods that I keep in mason jars, I simply use a vacuum-sealer attachment for the lids. It removes most all the air, thus reducing oxidation and increasing shelf life. So long as the dehydrated food is adequately dried to begin with, this combination works well. I dry all my foods by the “Dehydrators Bible”..I put it in Ball Jars(Mason Jars with new seals and throw in a brand new clay desiccant pack and vacuum pack it with a Foodsaver and the wide or narrow mouth lid attachment. I then put it in a dark closet to keep…It’s cool in the closet but not 54 degree’s…I figure as long as I can keep as many factors in saving dehydrated food as possible the longer it will keep…No Moisture…Very low oxygen…no light…working on a 54 degree cellar! Frank, my guess is one of two problems. 1st – Mushrooms were not dry enough. Mushrooms vary in texture so without knowing more it’s hard to guess what went wrong. 2nd – Mylar bag not sealed, seal broken or bag was punctured. I dry puffball mushrooms using a dehydrator and after other prep., place in Mason Jars followed by vacuum sealing. I store mushrooms and other foods I dehydrated in a spare freezer. I have never had any problems like those you listed. Hi Frank! 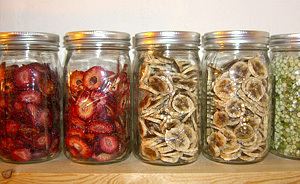 After dehydrating your mushrooms, did you immediately put them into storage? Did you let them cool on the dehydrator trays for awhile? I ruined a batch one time by putting the mushrooms into my storage before they had cooled. It would only be a guess, but you may have sealed them on a high pressure day. If you didn’t get enough of the air out, the lower pressure would (might!) make the bags expand as you describe. I know this thread is old but I’m just now getting into dehydrating as I inherited my mothers old, but very good quality dehydrator. I was wondering if I dehydrate and store in jars, no vacuum seal, is that ok? Or do I HAVE to use the vacuum sealer too? You can store the DH foods in a jar, but be careful of the residual moisture left in the food and the air. You might try using an O2 pack to help for longer storage. @Alicia, We store alot of our dehydrated stuff in canning jars. No vacuum sealing is necessary because the jar will keep out any humidity and moisture. That said, a vacuum sealed jar filled with dehydrated product (they make attachments for that) will increase the shelf life – but not necessary. Ken, is there a trick to successful using the jar sealers? I gave both the wide mouth and regular size ” Food Saver “jar lid sealers as presents to the DW but get less than 25% of them to stay sealed. Tried old lids new lids and two lids with little luck, so we just stopped using them? If I may help, maybe. Here is a really foolish question, but I like to start at the simplest, and not thinking your foolish by any means, ok? 1. You’re not putting the Ring on are you Just the lid? 2. Making sure the Lid and glass are very clean? 3. Getting a full vac, and the machine is shutting off on its own? 4. Slightly warming the Lids so they will seal? If you heat them in warm water make sure they are very dry. 5. When finished, I install Rings (it’s just what I do) make sure you don’t over tighten em. Thanks for the tips. Sure we’ve tried most of them but will try again. Seems like when we finish the vacuum and pull the lid sealer off, the lid pops off with the sealer. Next batch we try, I’ll keep eye on those details. This happens to me sometimes. Have you unplugged the hose and switched it around? Or cleaned the hose and jar attachments? That usually fixes the problem for me. Here is another idea, and may sound foolish again. Is the sealing rubber in the Vacuum Cap in the correct direction? The flare should be positioned down towards the bottom of the jar. I’m not sure if it would pull a vacuum is upside down, but something to look for. Ms. L makes a good point, make sure the unit is pulling a vacuum through the attachment hose properly. There seems to be a trick to sealing some jars. I read the cause is to different lengths on the jars where the ring secures the lids..I call the grid. I use two lids when sealing..the top upside down and it almost always seals. I also have a brake bleeder and it works when the sealer won’t. I’ve had some trouble with seals also and I now tend to hold a little down pressure while it seals. To help with moisture, make sure food is crispy and put silica packs out of meds in as well as oxygen absorbers. Last week went through all the items that were dehydrated and sealed in vacuum sealed bags and check the food put up into canning jars. This food was from 2012/13/14, here is what I discovered. The food dehydrated then sealed into the glass canning jars food is fine. The food placed into vacuum seal bags, it became chicken feed for the neighbors critters. Never knowing if you removed all the moisture out of the food, here is a way to test your dehydrated food, place the food into jars close with a regular lid, in a few hours if you find moisture your food was not completely dry. Back into the dehydrator it goes, and you can check it again using this method until you know it is completely dry. Anitque Collector Thanks so much for that trick! I have resisted this for so long and now I have to try this. Please add any “just getting started advice”, I want an entire system. @Texas boy, I believe that the Excalibur (linked in the article above) is the best consumer dehydrator model. I have a run-o-da-the mill Nesco dehydrator; have used for years and years, I also have an extra 4 trays for it. Works fantastic. I understand wanting the ‘best’ but it’s not the Dehydrator, it’s the operator that’s using the equipment. I only store my Dehydrated Foods in quart or 1/2 gallon Mason Jars. Like ol-what’s-his-name I use the Food Saver brand vacuum jar sealer, there two sizes of course for Reg and Wide mouth jars. I do not use O2 sorbs of Moisture Sorbs in the Dehydrated stuff, never had a problem, just make sure thr food is DRY!!!! I have some stuff that well over 4-5 years old, looks as good as the day I stored it. As the article states, it’s the storage place, Cool, Dry, No-Light, and if ya open it, reseal it and use it up within a few months, the ‘new-air’ will have moisture in it, so use it up. “just getting started advice”???? Just get started, just like Prepping, ya gata start. 1. Make sure you use good/great quality food to begin with. 3. Don’t’ rush the drying time by using too hot of temp, allow the Dehydrator to do its work, make sure to read the book. 4. I Vac-Pack right off the Dehydrator into the Jars, don’t allow it to cool, the warm foods also help to pull more of a vacuum when it cools. PS; when dehydrating, rotate the food and stir it up so it dries all the way around and is evenly dried. Texas boy; If I can add my 2cents worth to what NRP said; I have a Nesco dehydrator too, and you want to get a dehydrator with as high of a wattage as you can, it will take longer to dry stuff in a 600w dehydrator as opposed to one that is 1200w. Also you want to rotate the trays/shelves during the drying process. I have the cheapest made…the Presto brand. Even bought one from CL for $15 and now have 12 trays with the two dehydrators. I can say I have never had a problem with this brand. I like that I can put the trays in my dishwasher easily. I have little experience with dehydration but will try to compare it with freeze drying storage. I found that if the food was not completely dry, I would get settlement in the jars and upon opening them would feel some moisture. For this reason, I extend my drying time by a third just to make sure. I also place my jars in the oven at 250-300 before filling – this ensures a very dry jar and when the filled jars cool, a very good vacuum is achieved (lids pop down in a matter of minutes). I believe this to be as good as a mechanical vacuum sealer. I always use an O2 absorber. Additional comment – I am slowly changing over to using all jars instead of mylar or food saver bags. I feel that food in bags should be consumed in a couple of years but food in jars, I believe will last a decade if stored correctly. Besides, I like the look of the food even though it does take up more room this way. You also lose the 2 inch of edging on the plastic bag when opening and resealing, so bag is gone eventually. With a jar, nothing lost. Now, this is what I like about preppers. Good advice, in a very timely manner from experienced folks. Thanks all. Now to find the equipment. I mostly dry fruit, onions and bell peppers. I almost never reconstitute the dried fruit, just eat it for snacks. I use the onions in a dry onion soup recipe that I also store in jars and use for cooking. At first I was afraid the fruit was not dry enough, but I’ve figured out how it should look after a little experience. I’ve seen several comments over the last few months about using a brake bleeder as a backup for vacuum sealing. Just checked the Harbor Freight and Amazon websites and there are several types of brake bleeders. Since my expertise is not auto mechanics, can someone be a little more specific about which type of bleeder is best to use and how to use it? What connection do you use to fit the regular/wide mouth mason jars — or mylar bags? Amazon link would be helpful if possible. It doesn’t matter what brand–mine was about $15 on sale. I just use the bleeder with the sealer cap–wide mouth or regular–by putting the cord into the hole in the cap. Then you start pumping the guage that has the meter and you’ll know when the lid seals–most of the time you even hear it. Sometimes I pump for just 30 seconds, sometimes a lot longer–depends on the texture of the food you are sealing. Oh, when my vacuum sealer has trouble sealing, like a powdered substance like cappuccino, the brake bleeder works much better. When I bought my Food Savor, it was for river trips. I could pre-make biscuit gravy, spaghetti sauce, hollandaise sauce, cacciatore, carbonara, whatever. Then freeze it (which means I need less ice in the cooler), and it became a boil in the bag meal. I absolutely fell in love with it! Easy to prepare and way fewer dishes to be washed at camp. I don’t like it so much for preserving dehydrated foods. I have a fairly high rate of bags being punctured​ by dried veggies. I am about to purchase a vacuum sealer for jars. Seems like a must better way to go than bags. Thanks for the advice everyone!!! Double bag or place in paper lunch bag to prevent sharp edges making holes. I sealed a lot of junk food–comfort food–and placed in 5 gallon buckets to see if they would last longer last August. We just finished the last of the junk food and all tasted great but one little chocolate cupcake-type thingy. I put lots of the soft items inside the plastic and placed inside another plastic and it prevented the food from being squashed. Little Debbie cakes are great for this. Note: 9 months is not a long shelf time, but is better than nothing. I put little chocolate snack bars in mason jars and they will last a long long time. We have had our Excalibur dehydrator for several years now and have had mixed results with preserving the dried foods. If we dry onions to a very crisp, dried out stage, they seem to last a long time (4+ years and counting). The same goes for herbs from the garden. Basil, Rosemary, Sage, and Oregano all seem to keep well if thoroughly dried. Bananas, apples, carrots, pineapple, blueberries, fresh figs, etc. – all seem to be hit or miss! I have not figured out what the difference is between one jar and the next. Some will last longer than others, but with those items it seems the best we have accomplished is 3-4 years at best. Homemade jerky only lasts about a month at best – but that’s because it gets eaten!! We have been storing in mason jars, but we have NOT been vacuum sealing them. I intend to try that as we have a vacuum sealer with the jar attachment. On another note, we divided 50 lbs of rice into mylar bags, placed them in buckets, dropped an oxygen absorber into each, then popped on the lids. The next day, the buckets were all deformed as if they had been sealed under incredible vacuum. The sides of the buckets were bowing inwards. Has anyone else experienced this? In regards to the rice placed in Mylar/buckets. Did you remove all the excess air from the Mylar bags before sealing them across the top with either a flat bladed curling iron or a clothes iron? There are videos showing the correct way to seal food(s) for long term storage. For myself found a curling iron with flat blades works better, and I did not wish to mess with a clothing iron sealing the bags on a 2×4. Personally prefer the smaller pleated bottom bags with a zip top for every day usage and same bag without the zip lock up to a 2 gallon. It limits what food is exposed to every day elements and the time frame for being used up. Depending on the what is being stored I can have 2-3 bags in a 5-7 gallon food grade bucket. In reference to the fruit & dried vege’s where you are having a hit and miss on the long term storage. Will let you know what I picked up from another sites knowledgeable contributor. Place the fruit into jars after drying leave on the counter, if you find moisture after a couple of hours. Place the fruit or vegetable back into your dehydrator for another round of drying, when it meets your requirement then place into the jars and vacuum seal. Quick question for this fantastic thread. I have a couple packages of canned chicken and roast beef that I dehydrated one year ago in the freezer. They are sealed in zip locs after the meat was cooled. I use these for backpacking, any thoughts on if these would still be good. I don’t want to get out in the backcountry and have bad food. In my opinion, it sounds like they will be fine. Even non-dehydrated meats will last a year in the freezer, so your dehydrated should be okay if the processing itself was okay. Great tips, I have an Excalibur tray dehydrator, usually, the food gets eaten by the kids so we don’t really keep it in storage. Will definitely come back to this article when I store the food. I want to dehydrate milk, what is best, I get raw from a local dairy or store bought? How long should it last sealed in a mason jar? Any other suggestions? They need to be very dry, before they are packed. if they snap when bent are dry enough.Pack with oxygen absorbers Have them in clean jars. as long as lids are clean and not damaged on inside they will work, so can use used lids for this purpose if you have them..
… I use one of the Hot hands hand warmers per quart- to half gallon jar. ( available in hunting and camping sections of wal mart… Prepare these by opening and shaking allow them to get really warm(10-15 min..).. then put in top of jars..as the oxygen is removed, the jar lid will seal. I recheck my lids every 6 months. if something is unsealed I use promptly or add a new oxy absorber. will keep a very long time as long as protected from light and heat and still sealed…oxygen, light and heat are the enemies of long term stored food.. Hope this helps.